Scharf’s mural is part of the exhibit, which opens this week and runs through December. It’s a must-see at LoDa Artwalk on Friday, May 10. The mural will remain after the exhibit ends. 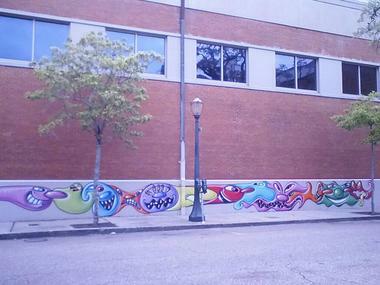 The chain of mischievous, amorphous characters Scharf is spraying on the Jackson and Conti St. sides of Space 301 ensures that the building will never again go unnoticed by passersby. View our vibrant and exciting Kenny Scharf collection here.